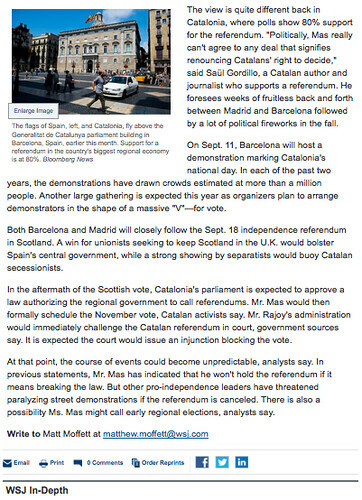 "(...) The view is quite different back in Catalonia, where polls show 80% support for the referendum. "Politically, Mas really can't agree to any deal that signifies renouncing Catalans' right to decide," said Saül Gordillo, a Catalan author and journalist who supports a referendum. He foresees weeks of fruitless back and forth between Madrid and Barcelona followed by a lot of political fireworks in the fall." 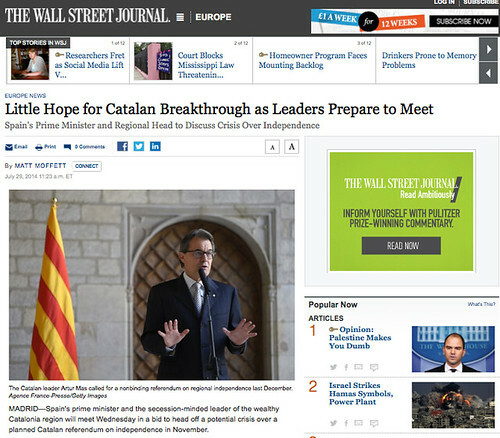 Aquesta és la referència que apareix en el reportatge Little Hope for Catalan Breakthrough as Leaders Prepare to Meet, publicat aquest 29 de juliol pel periodista Matt Moffett a The Wall Street Journal sobre la situació política a Catalunya i les tenses relacions Madrid-Barcelona.